Turns out good Riesling is cheaper than vintage posters. We've always got wine in the house, but until a recent find at a garage sale, no posters. Today I picked this up from the picture framer. It cost eight dollars for the poster, and alot more than that to have it framed - I did try Ikea (I'm not a fan - it's bedlam here in Perth, I always feel like one of those lab rats stuck in a maze...) but alas, none of their frames were the right size. The lady we bought it from has the most marvelous 60's home, in original nick, not ponced up, right on the banks of the Swan (River). She bought the poster herself while she was on holiday in France. Just the colours and the feel of the ink on paper were enough for me - it may be a spring chicken in the world of vintage posters, but I love it. Here's a vintage poster currently for sale at Galerie Montmarte in Melbourne, designed to celebrate "the new wine" in 1993, just as our poster was, five years earlier. Beaujolais Nouveau is basically a young (very young - now you get the baby reference) red wine made from Gamay grapes grown in the Beaujolais region of France. Every year on the third Thursday in November, just weeks after the grapes have been harvested, there is a race to deliver the first of the vintage. 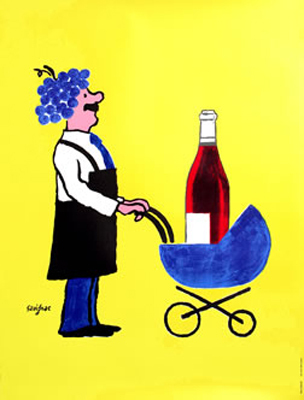 Posters like these are made to celebrate the arrival of the new Beaujolais. but I think I like ours more...because it's just that, ours! Anth says:﻿ "apparently it is quite tasty, but I can't bring myself to try it..."
If you think you could do better or worse(!) don't forget to sign-up for the Lucy Violet Vintage/Hung Up On Retro "It's a Retro Cook-Off". We'd love you to join in. Just click that little button in the top corner of my blog to find out how. p.s. I forgot to mention that Georges Duboeuf is the founder of Les Vins Georges Duboeuf, one of the largest and best known wine merchants in France. Framing is sooo expensive! i think Mr D should do that as a job and we could be rich!! Bleurg, that pinapple surprise is making me feel queasy. But the poster. FABULOUS find Kylie it's a beaut! I love your poster! The colors are beautiful, and I'm partial to anything done in pastels/chalk, which it looks like the original was. As for the pineapple surprise, that sort of pineapple and cheese salad is standard fare at cafeterias here, but I confess that I'm not a fan. I was going to ask where's the surprise in the Pineapple Surprise....and then saw Dana's comment...cheese? I thought it was carrot and cabbage - like a chunky pineapple coleslaw...but CHEESE? yep, that's a surprise indeedy. Lovely poster! And I couldn't agree more about Ikea. What a craaaaazaaay place that is. Your poster is lovely (I far prefer it to the other one) - it has the most fabulous combination of colours and looks wonderful with your deep red roses. Don't think I could bring myself to try the pineapple surprise myself either somehow! Love the poster, just purchased an old 60's travel poster myself, I love them too!. The framing looks fantastic well worth it - just bought a larger frame at Ikea and it broke as soon as we tried to hang so no love lost there!. Great vintage find - love it. Love the poster! Great colours. Excellent find. Pass on the pineapple salad. Bluuurrgghhh (gag noise). Gorgeous poster, the frame is pefect. Not sure I like the look of pineapple suprise though. I'm curious about the name of your blog - my grandmother (age 93!) is Violet Lucy and it's a family name! Thank you for the reply - that's amazing I think there's something in the name, or maybe it's just the great age that makes you brutally honest! I wrote a post about her earlier in the year when she came to stay. She's been to Australia a couple of times to visit distant cousins in Sydney. so, ikea's bedlam just about anywhere, right? thanks for the info on wine. i myself loathe beaujolais, but that doesn't mean i hate the posters!